Ellie (lower) and CG (upper) have learned to take advantage of our cat tree at the same time. Windows and cats are like peas in a pod — they just go together. Windows don’t just allow kitties to see outside; they allow an exciting or peaceful diversion by giving your cat the opportunity to watch birds, leaves, people and more. 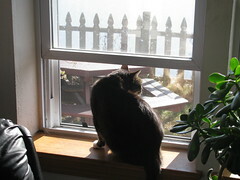 During nice weather, an open window (with secure screen, of course) can be a cat’s favorite place to lounge. However, kitties with cerebellar hypoplasia may be limited by their mobility, making it impossible to gracefully access a window sill like any other cat. But there are ways we can help. Reposition chairs, kitty condos and more: If your CH cat can climb, try placing a secure kitty condo or chair in front of a window. Place your cat on top of the condo (or chair, if possible) so he understands its purpose. Perhaps try running through the process with your cat, or entice him with a toy or treats so he’ll soon figure out that by simply climbing up the condo or chair, he’ll be able to look out the window on his own. If none of those suggestions work, try opening the window. That should pique his interest! However, once on top of the condo or chair, keep an eye on how your cat gets down. If your cat is a less-than-graceful jumper, try placing an area rug in his landing spot. That may help prevent a few chipped teeth and other injuries! Glass doors: I understand this isn’t a possibility for everyone, but if your cat’s CH is severe enough this may be a good option. Sliding glass doors or doors with large, clear glass panels allow your kitty to easily see much of the outside world without having to move much. If your windows look out to your backyard or have an uninteresting/unchanging view, strategically place a bird bath or bird feeder in your yard. That should guarantee that you cat has something to watch! One thing to keep in mind, too, is that some CH cats are especially nervous. If your cat falls into this category, be particularly patient with him. For example, while CG loves looking out windows, he becomes very nervous if he sees a car drive by — and he jumps down anxiously. However, as you may has read the other day, he *loves* watching birds outside — and nothing will keep him from that! Does your CH cat like to look out windows? How have you made this an option? 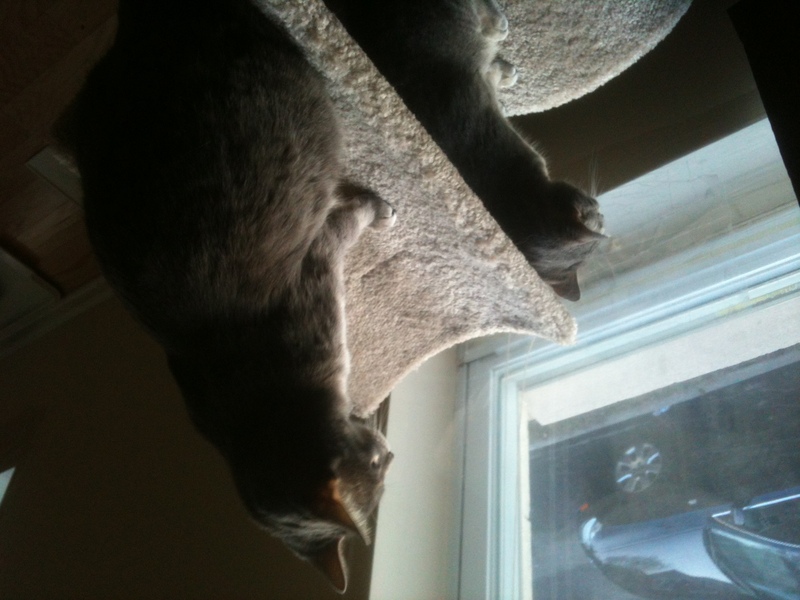 Do you have furniture or cat trees strategically placed? Please share in the comments! Hi Amanda, because I of my disability, I spend several hours in bed each morning after I wake up (I cannot move very well). The head of my bed is where a nice window with an awesome view of my garden is. Percy’s morning routine after breakfast and pottying is to meow and flop his way to me in bed where I lift him up and he scrambles to the window and relaxes on a pillow by watching birds, our other cats and dogs and whatever else pleases him. It is a wonderful routine for the both of us. We both enjoy it. I open the window so he can take in all the wonderful smells. So far I have not figured out a way for him to sit in the window in the living room, but that’s okay, we have our little morning respite and it is special for both of us.